I have been sewing, creating textile and art pieces all my life and strongly believe that “creativity feeds the soul”. I am passionate that everyone should be given the opportunity to discover their own creative potential, whether it is through sewing, textiles or art. I was trained in Fashion and Textiles and over the past 30 years, I have been fortunate to teach students of a wide age range. 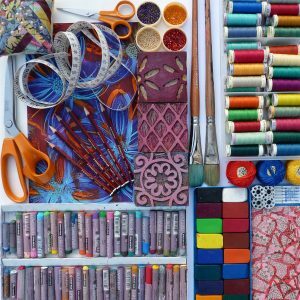 After running the Textiles Department at Hereford 6th Form College for 11 years I decided to set up my own creative workshops, which include art and textiles techniques to sewing methods. I cater for all ages groups and particularly want to dispel the myth that, sewing and textiles is a female pastime only! My courses take place at my studio in Tillington and at other venues around the county.